The West Coast Book Prize Society is thrilled to announce the finalists for the 2016 BC Book Prizes. Congratulations to our finalists: Linda Bailey, Susin Nielsen, Sara O’Leary, and Julie Morstad! Winners will be announced on Saturday, April 30, 2016. Lewis is initially delighted with his new bedroom, a secluded tower in a remote part of a decaying seaside mansion. Then he discovers that it’s already occupied—by the ghosts of seven dead pirates. Worse, the ghosts expect him to help them re-take their ship. The only problem is that this motley crew hasn’t left the house in almost two hundred years and is terrified of going outside. As Lewis warily sets out to assist his new roommates, he begins to open himself to the possibilities of friendship, passion, and joie de vivre and finds the courage to speak up. Linda Bailey has won awards across North America, including the California Young Readers’ Medal, the Georgia Storybook Award, the Ontario Blue Spruce and Silver Birch Awards, and the Oregon SMART Award. Stewart Inkster is academically brilliant but “ungifted” socially. Ashley Anderson is the undisputed “It” girl of grade nine, but her marks stink. Their worlds are about to collide when Stewart and his dad move in with Ashley and her mom. Stewart is trying to be 89.9% happy about it, but Ashley is 110% horrified. She already has to hide the truth behind her parents’ divorce; “Spewart” could further threaten her position at the top of the social ladder. They are complete opposites. And yet, no matter their differences, they share one thing in common: they are all made of molecules. Susin Nielsen has received two Canadian Screenwriter Awards and a Gemini Award. She is the author of award-winning novels Word Nerd; Dear George Clooney, Please Marry My Mom; and The Reluctant Journal of Henry K. Larsen. Sadie is a little girl with a big imagination. She has been a girl who lived under the sea and a boy raised by wolves. She has had adventures in wonderland and visited the world of fairytales. She whispers to the dresses in her closet and talks to birds in the treetops. She has wings that take her anywhere she wants to go, but that always bring her home again. She likes to make things—boats out of boxes and castles out of cushions. But more than anything Sadie likes stories, because you can make them from nothing at all. Sara O’Leary is the author of the award-winning series of Henry books: When You Were Small, Where You Came From, and When I Was Small. Julie Morstad‘s book How To was a 2013 Governor General’s Award finalist. Indigo shared their best books of 2015 for kids and teens on the weekend and we are thrilled to see our titles on these lists. Congratulations to our talented and hardworking authors and illustrators! While banished to a dusty study one day “to think things over”, a boy pulls a book off a shelf and with great reluctance begins to read. As the afternoon passes, the story nabs him and carries him away. Before long, this good little book becomes his loyal companion, accompanying him everywhere … until, one day, the book is lost. Will this bad little boy get back his good little book? A bug flies through an open door into a house, through a bathroom, across a kitchen and bedroom and into a living room … where its entire life changes with the switch of a button. Sucked into the void of a vacuum bag, this one little bug moves through denial, bargaining, anger, despair and eventually acceptance – the five stages of grief – as it comes to terms with its fate. Will there be a light at the end of the tunnel? Step right up! Step right up to the amusing amusement park! It’s a whole story, and the pages have holes! Watch the holes make pictures! Frank Viva’s tale of a boy spending his birthday at the amusement park will amaze readers big and small with astounding die-cuts that transform both words and pictures in delightful ways. InvisiBill is the hilariously absurd, tongue-in-cheek story of an ordinary middle child who feels so overlooked by his busy, distracted family that he becomes invisible … or InvisiBill! Snow White is on the run from an evil witch when she comes across some dwarfs in the forest. They agree to take her in and keep her safe if she will help them with their chores. She soon realizes she’s taking on a lot more than she bargained for. 77 breakfasts to make, 77 lunches to pack (don’t forget the juice boxes! ), 77 pairs of pants to mend and a whole lot of dishes. This is a hilarious retelling of the classic tale, with bright, energetic illustrations featuring busy dwarfs, and the even busier Snow White. Miss Petitfour enjoys having adventures that are “just the right size – fitting into a single, magical day.” She is an expert at baking and eating fancy iced cakes, and her favorite mode of travel is par avion. Join Miss Petitfour and her equally eccentric felines on five magical outings – a search for marmalade, to a spring jumble sale, on a quest for “birthday cheddar”, the retrieval of a lost rare stamp and as they compete in the village’s annual Festooning Festival. A whimsical, beautifully illustrated collection of tales that celebrates language, storytelling and small pleasures, especially the edible kind! Lewis Dearborn is a lonely, anxious, “terminally shy” boy of eleven when his great-grandfather passes away and leaves Lewis’s family with his decaying seaside mansion. Lewis is initially delighted with his new bedroom, a secluded tower in a remote part of the house. Then he discovers that it’s already occupied – by the ghosts of seven dead pirates. Worse, the ghosts expect him to help them re-take their ship, now restored and on display in a local museum, so they can make their way to Libertalia, a legendary pirate utopia. The only problem is that this motley crew hasn’t left the house in almost two hundred years and is terrified of going outside. As Lewis warily sets out to assist his new roommates – a raucous, unruly bunch who exhibit a strange delight in thrift-store fashions and a thirst for storybooks – he begins to open himself to the possibilities of friendship, passion and joie de vivre and finds the courage to speak up. Pub Date Giveaway: In the comments below, please tell us which new May 2015 release of Tundra’s you would love to read and one lucky reader will receive their requested book (Canada only for We Are All Made of Molecules)! One request per person and please review our rules. This giveaway ends at midnight on Monday, May 18, 2015! UPDATE: Congratulations to Nicole, winner of We Are All Made of Molecules. 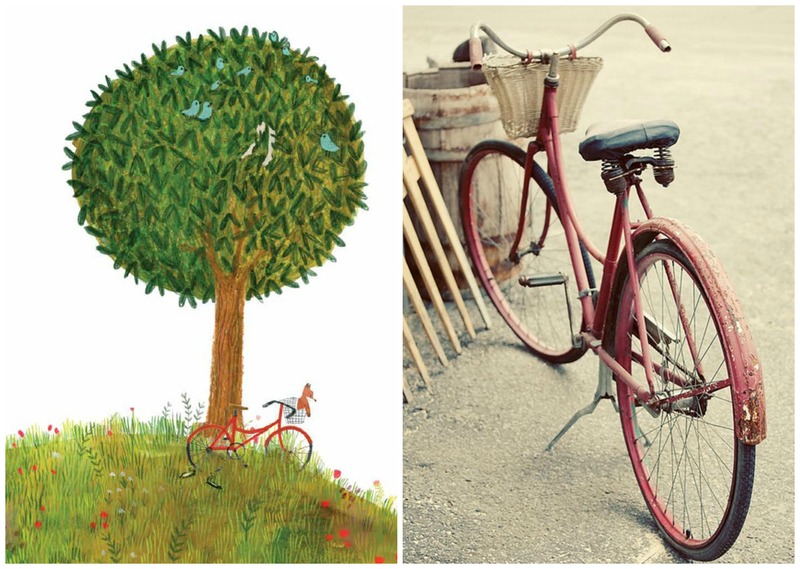 Samantha Devotta: One of the books I’m most excited for is Sara O’Leary and Julie Morstad’s latest collaboration, This Is Sadie. It comes out next week, and it’s one of the sweetest stories I’ve ever read. Sadie is a little girl with a big imagination. We thought it would be nice to see if we could find real-life counterparts to scenes from Sadie’s adventures. As an Alice in Wonderland fan, my favourite spread is when Sadie throws a Mad Hatter-worthy tea party. This girl is very Sadie-like with her pretty dress and, of course, the bunting in the background (we at Tundra love bunting!). 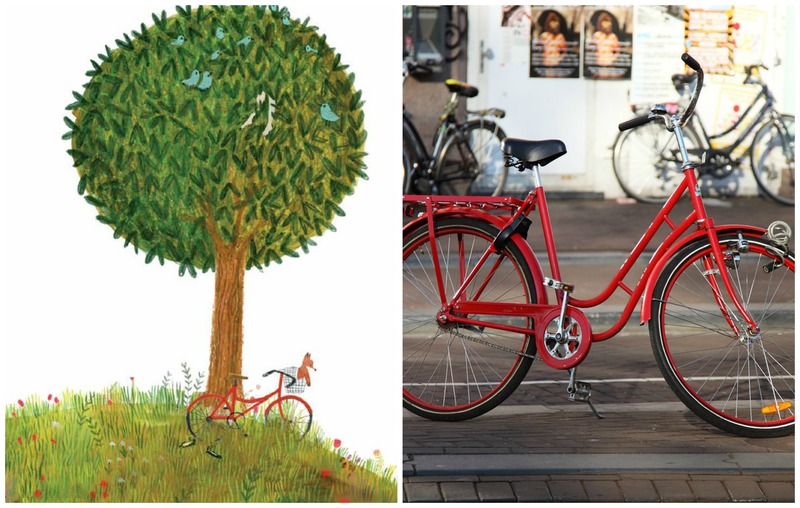 There’s no basket on this shiny red bike yet, but the resourceful Sadie would definitely be able to come up with a solution! 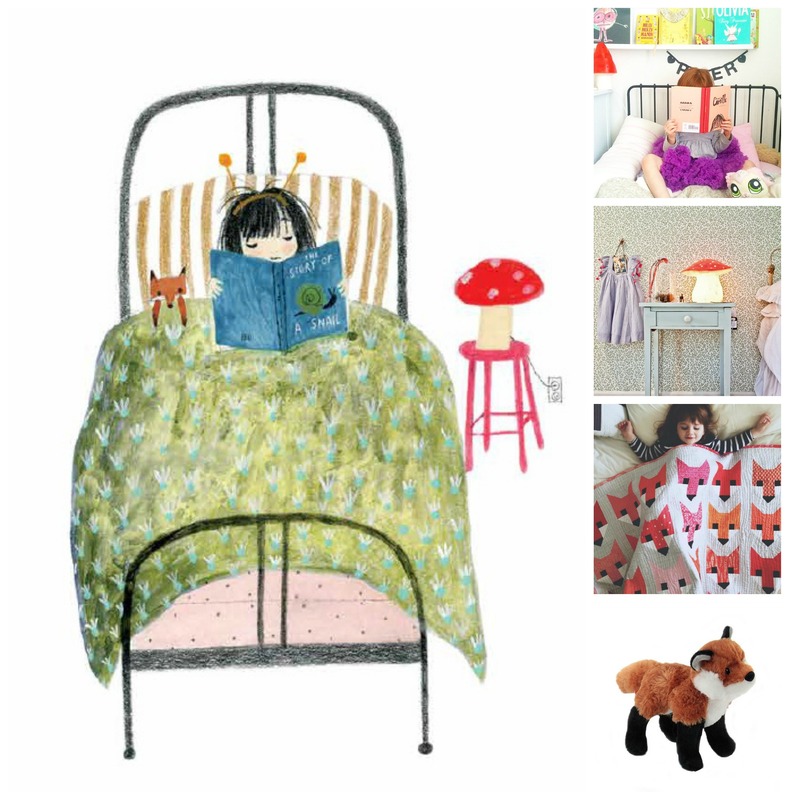 Sadie’s room is whimsically decorated with a mushroom lamp, bunting, and her plush fox family. Who wouldn’t want to curl up with a book in a room like this? 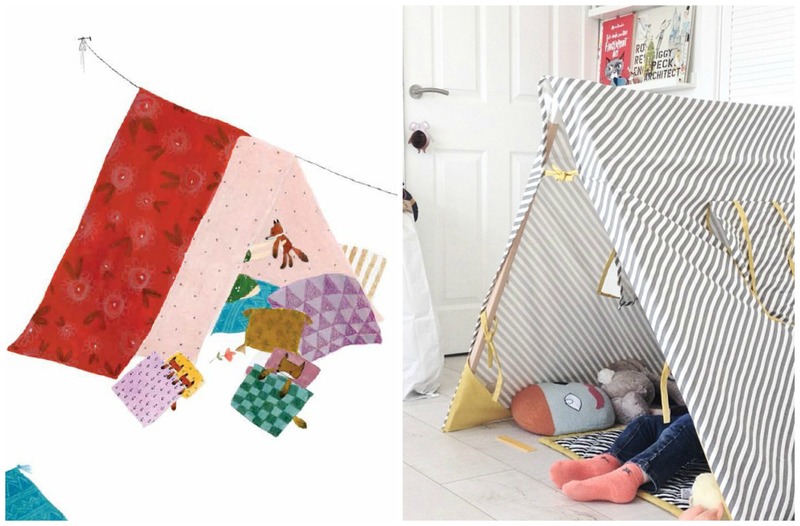 Sadie also builds herself a blanket tent where she can hang out with her foxes and plan some more adventures. This little guy already has the tent and animal pals covered! So cute! I think it might be time to makeover my own bedroom. If you’d like to see more real-life Sadies, please check out thisissadiebook.tumblr.com or the Sadie pinterest page. And if you have a Sadie in your life, please feel free to email a photo to ThisIsSadieBook@yahoo.com so that you can be added to the website!